The lack of managerial interest has created some changes in how this and future tournaments will work. We will run this tourney with 6 teams and start at 9:00 am Memorial Day Sunday, not the traditional 8:00 am. This year's spring tourney rosters will contain a higher eddie/core relationship than in tournaments past (I will explain why in the next paragraph). There are a total of 78 roster spots available (6 x 13). We have 6 manager tandems consisting of 7 eddies and 5 core players. With a minimum of 5 eddies per team, that leaves 23 additional eddie openings and 43 additional core openings. I suspect we will not have a problem filling the draft candidate list with only 66 draft spots available. The number of females that register will dictate the eddie/core requirements. If we get 18 more girls, we will go with the the traditional 4-4-3. Any less and the requirements will be adjusted. 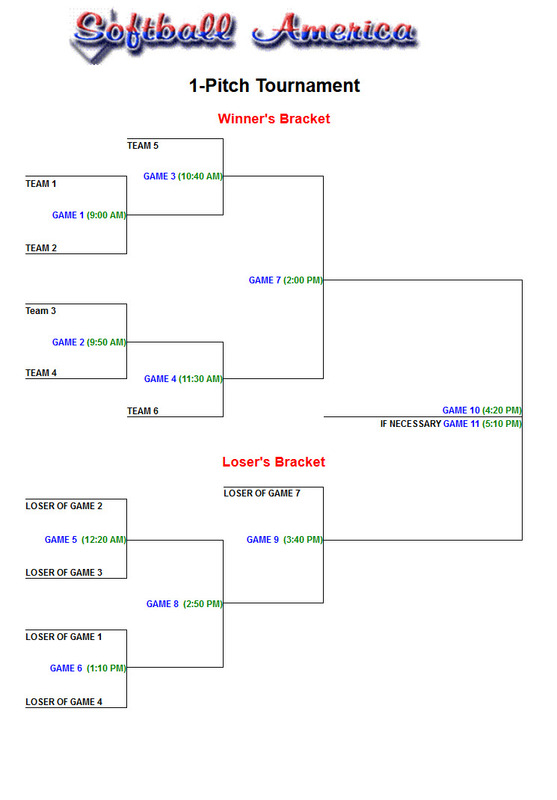 I am making the Memorial Day tournament more coed oriented because I plan on replacing the Labor Day Coed tourney with a Labor Day Men's tourney. I haven't decided whether the Labor Day men's tourney will be an 'enter a full team' tournament, a round by round draft affair where teams are built from scratch, or a combination thereof. Please note: This tournament is a metal bat affair. All players will be required to use a bat in accordance with and as set forth by Softball America’s regular season bat restriction policy. DO NOT register for this tournament unless you are reasonably certain you will be able to attend. 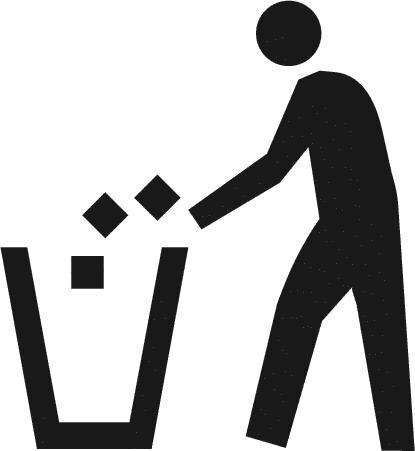 If, after registering for the tourney, you find you cannot attend, please be considerate enough to notify the league office as soon as humanly possible. Rain Date: A rain date shall not be scheduled. If the tourney cannot be played on May 27th, it will not be played. This is a 1-day coed softball event. Six teams will be formed entirely through a draft system based on individual player statistics. The 6 teams will then compete for 1-pitch supremacy. Each batter receives 1 pitch. If the pitch is fouled off, swung at and missed, or hits the mat behind home plate, the batter is struck out. If the pitch is a ball, the batter walks. The rest of the game is played in normal fashion. Winning teams will receive their choice of custom jackets or custom sweatshirts. Plaques and trophies will be awarded to the winning managers and tournament MVP's. This is truly a great day of softball, fun, food and drink-- kind of like one big picnic where a softball game breaks out every 50 minutes. It's also a great way to meet other Softball America league members. Bring chairs, tents, coolers, and whatever else to make yourself comfortable. Make a day of it or come and go as you please. Members will be listed in the body of the draft on a first come, first served basis. 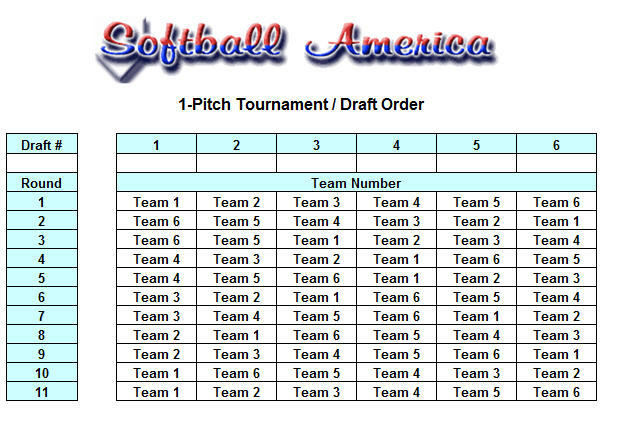 Entrants must be, or have been, a registered member of Softball America at some point in the past 23 years. Outsiders to the league are not eligible to participate. Along with 6 manager tandems (12 players), an additional 66 players can register to be drafted. The minimum player breakdown is listed below. 3. A 3-3-2 eddie rule will apply for this tournament - 3 eddies must be in the line-up, 3 eddies must play the field, 2 of the eddies in the line-up and field must be female. Draft candidate statistics are listed below. A pdf copy is available for download at the following link. As mentioned, this tournament will be an eddie oriented affair. The focus will be more on eddies, in particular female eddies. Should a female eddie sign up and there isn't any room in the body of the draft, any male eddies over and above 6 will be moved to the core section. Any core player(s) that entered after the male eddie (bottom of core list) will be moved to the alternate list. Any male eddie moved to the core list is there only to make room for the female eddie(s). All male eddie privileges remain intact. My reasoning behind placing a priority on the females is because this is the only tourney they will be eligible to enter. Male eddies and core players alike will be able to enter the Labor Day Men's 1-pitch. The females will not be eligible. As of this posting there are 8 eddie spots available. We will be hard pressed to reach my goal of 24 females. If we do, great. If not, I will adjust the eddie requirements downward. Core players that sign up moving forward will be placed on the alternate list. Alternates will move into the body of the draft as draft candidates bail out. Andy will not be at the field for this tournament. The snack bar will not be open. With Andy not being there and Tim O'Shea not around to make sure the ball field area gets cleaned and put back together, I am concerned. It is imperative the ball field is left in good condition. If it turns into a landfill as a result of the tournament, we can all kiss the tournaments goodbye. That is not a threat. It is more of a guarantee. The ball field owners (Eureka Quarry) will not hesitate to pull the plug on us. Please keep that in mind when you pack up your stuff and leave at the end of the day. Richard Stead was not listed as a male eddie on the entry form. I will make the adjustment. The Memorial Day 1-Pitch Tournament draft will be held on May 20th at the Quarry ball field immediately following the lone Sunday Coed playoff game (2:45 pm). Plan on a 4:00 or 4:15 pm start time. With postponed Sunday Coed games moved to the 20th of May, the draft will now start at 7:45, immediately following the 6:30 coed game. A 3-3-2 eddie rule will apply for this tournament - 3 eddies must be in the line-up, 3 eddies must play the field, 2 of the eddies in the line-up and field must be female. Co-manager Jamie Burns (fe) can no longer attend the tournament. Lauren Wood (fe) has been moved from the body of the draft to the co-manager position with John Kiefer. Tom Collins (me) has been moved from the alternate list to the body of the draft. Angela and Connie Georgiadis can no longer attend the tournament. Alternates Ryan Garges and Christian Hazlett have been moved from the alternate list to the body of the draft. Ray Pantano can no longer attend the tournament. Alternate Dave Ward has been moved from the alternate list to the body of the draft. It was inevitable. The 1-pitch tournaments have been run 33 consecutive times since the fall of 2001 without a a single complete rainout. Today we were completely rained out. I'm not surprised. This year we've seen it all. Snow, rain, hail, black outs, brown outs, and ball field closures. Maybe Mother Nature will be kinder to us moving forward.